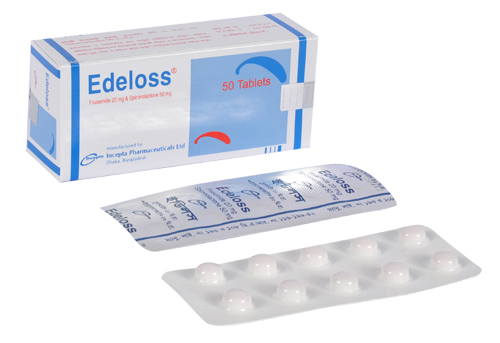 Edeloss: Each film coated tablet contains Frusemide BP 20 mg & Spironolactone BP 50 mg.
Edeloss Plus: Each film coated tablet contains Frusemide BP 40 mg & Spironolactone BP 50 mg.
Edeloss is a combination drug, containing a short-acting loop-diuretic, Frusemide and a long-acting aldosterone antagonist, potassium-sparing Spironolactone. Preparation of these two, shows complementary mechanism of action to result in a powerful diuretic effect. Frusemide inhibits Na+/K+/2Cl- co-transport at loop of Henle and there occurs inhibition of electrolyte and water reabsorption and Spironolactone acts on collecting tubule to block the aldosterone receptors competitively thus inhibiting sodium retention and potassium secretion. As a result sodium excretion is largely enhanced & loss of potassium is suppressed thus a total positive effect on diuresis is achieved. Edeloss: 1 to 4 tablets daily, orally, according to the patient\'s response. 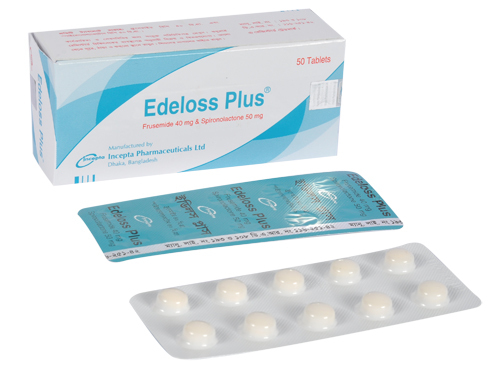 Edeloss Plus: For previously stabilized patients 1 to 2 tablets daily, orally. Generally, this combination preparation is well tolerated. However, a few side effects like nausea, malaise or gastric upset, headache, hypotension, skin rash may be seen which disappears after withdrawal of the drug. Caution should be taken in patients liable to electrolyte deficiency. This preparation should also be used with caution in diabetes, enlarged prostate, hypotension and in hypovolemia. Pregnancy: There is clinical evidence of safety of Frusemide in pregnancy but Spironolactone may cross the placental barrier. So it should be used in pregnancy only if strictly indicated & for short-term treatment and if expected benefits to the mother is greater than the possible risk to the fetus. Lactation: It is contraindicated in lactating mother.